We were one of the first U.S. media outlets to warn that Beijing's desire to cordon off the South China Sea would set it on a collision course with Washington. It was a year later that big news organizations like The New York Times finally grasped the explosive potential of China's moves there and began reporting them. At the time, we wrote that the risks were high – so high, in fact, that even a relatively minor act or misreading of intentions could trigger some kind of military response. You know, the kind of thing foreign-policy wonks call "an international incident." Into all of this steps Republican presidential front-runner Donald Trump. China hasn't escaped the infamously "forthright" businessman's rhetoric. Out on the campaign trail, Trump has called out China for manipulating its currency and promises to use the military to ensure that events in the South China Sea break "America's way." 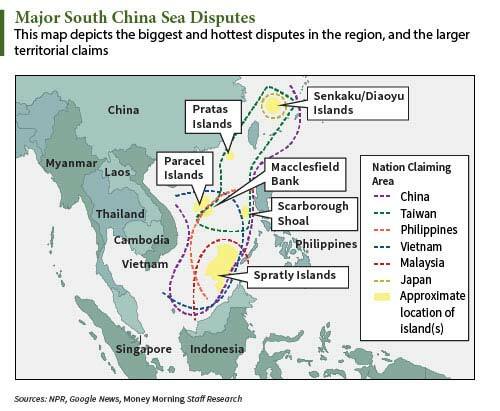 All good investors have to understand the risks in any situation, and the South China Sea is no different. Because global stability and billions in profits hang in the balance here. On Wednesday, the Taiwan Ministry of National Defense confirmed that surface-to-air missiles (SAMs) had been deployed on Woody Island, part of the Paracel Islands – just one of the strategically placed South China Sea land masses that are claimed by multiple countries (see accompanying map). Pentagon officials backed Taiwan's claim by saying the deployed missile batteries could be seen on commercial satellite imagery. The missiles – and other air- and sea-defense systems – have been on Woody Island for years, Beijing claimed. But the revelation was said to alarm Taiwan, Japan, and other nations in the region. "We have deep concerns over such actions and want to re-emphasize that Japan cannot accept it," Suga said. China controls the Paracels – though Taiwan and Vietnam also claim them. In all, there are nine nations – some staunch U.S. and Western allies – embroiled in some form of dispute over the islands and waters in the region. In the South China Sea (and in the East China Sea, where China has repeatedly clashed with Japan), Beijing has claimed increasingly larger swathes of a region that's home to rich fishing grounds, vast energy deposits, key military bases, 50% of the world's tanker shipments, and five of the top 10 shipping ports on Earth. Unfortunately, after a highly promising start, the "pivot" stalled – or has been very poorly executed. And critics claim that Washington's repeated failures to respond to China's aggressiveness and land-reclamation efforts served to embolden Beijing. But here's the part that continues to stump me: Despite the growing global importance of this area – home to an estimated 1.5 billion people – the South China Sea standoff continues to get minimal coverage in mainstream U.S. news media. Quite possibly as an offshoot of this media underplay, this geopolitical skirmish is clearly not a key "worry point" among most U.S. investors. 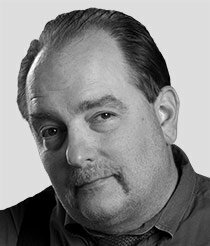 But it won't take much to put the story on U.S. front pages in a way that roils the financial markets – perhaps enough to vapor-lock the global economy. I'm not being melodramatic here. In October, Admiral Wu Shengli, commander of the People's Liberation Army Navy, warned his U.S. counterpart that – because of America's so-called "provocative acts" in the disputed waterway – it would only take a minor incident to spark a shooting war. Those allegedly "provocative acts" are pretty easy to identify. Perhaps realizing it was losing control of the situation, and risked losing face with its allies – or perhaps because it understands the horrid ramifications of having Beijing shut down free access to the shipping and flight corridors to one of the world's most important economic regions – the Obama administration in recent months has attempted to push back. In October, the U.S. Navy sent a guided-missile destroyer close to one of the artificial islands Beijing has built in the South China Sea. The Navy followed up by promising to conduct patrols within 12 nautical miles of those man-made isles about two times a quarter – moves the United States says will assert its rights under international law. In November, the U.S. Air Force sent some of its Boeing B-52 Stratofortress bombers on a flight that took them near some of China's artificial islands. And in December, the Pentagon said it based one of its newest surveillance jets in Singapore. In a joint statement, U.S. Defense Secretary Ash Carter and Singapore Defense Minister Ng Eng Hen said that a U.S. Navy P-8 Poseidon jet would operate out of Singapore from Dec. 7 to Dec. 14. The jet, built by the Boeing Co. (NYSE: BA), was added to the Navy's aerial fleet starting in 2012. The jet is designed to conduct anti-submarine warfare (ASW), anti-surface warfare (ASUW) and shipping "interdiction." But what really raised Beijing's hackles is the fact that the Poseidon is also used for something known as electronic-signals intelligence – known in military parlance as ELINT. The mainstream press refers to this as a "spy plane." "I think this kind of increase in military deployment by the United States and pushing regional militarization does not accord with the joint long-term interests of the countries in this region," Hua Chunying, a Chinese Foreign Ministry spokeswoman, told reporters back then. China's stance is that it's against the United States "militarizing" the South China Sea. And Beijing says that it's merely protecting its sovereign territory. "Deployment of defense facilities in our own territory is appropriate and reasonable," Hong Lei, a China Ministry of Foreign Affairs spokesman, told reporters. "It's aimed at improving our national defense capabilities and has nothing to do with so-called militarization." But Washington counters by saying that Beijing's actions – creating artificial islands complete with airstrips, ports, and missile-defense systems – are the literal definition of "militarizing." On a visit to Japan Wednesday, U.S. Navy Adm. Harry B. Harris Jr., head of the U.S. Pacific Command, said the deployment of the SAMs contradicts the pledges not to militarize the South China Sea that China President Xi Jinping made last year. "This calls into question the seriousness of President Xi's statement," Adm. Harris said. "It concerns me greatly because this would be a clear indication of the militarization of the South China Sea." Here's a bit of interesting context. It's one that we just told you about this month. And it underscores how Beijing is maneuvering to get the strategic upper hand in the South China Sea. In their unified attempt to blunt the emerging nuclear threat otherwise known as North Korea, the United States and its allies Japan and South Korea have been talking about the possibility of installing a shared system of missile interceptors on the Korean Peninsula. The objective, obviously, is to create a way to shoot down Pyongyang-launched ballistic missiles, should the North Korean nuclear program come to fruition, as many U.S. defense officials expect it will. The Pentagon has been pushing its two allies to adopt an advanced U.S. missile defense shield known as Terminal High Altitude Area Defense, or THAAD. THAAD is being designed, built, and integrated by a veritable "Who's Who" of U.S. defense sector outperformers, like Lockheed Martin Corp. (NYSE: LMT), Raytheon Co. (NYSE: RTN), and Boeing, among others. But the U.S. vision wasn't resonating with Japan or South Korea. In South Korea, sentiment had been running toward a "homegrown" anti-ballistic-missile (ABM) technology – a stance that Beijing found palatable. China had actually lobbied Seoul to avoid using THAAD. The reason: It would be able to shoot down China's missiles, as well as those launched from North Korea. The "diplomatic tussle" over THAAD became unusually rancorous in the normally upbeat Beijing-Seoul relationship, and South Korea's leaders were leaning away from adopting the U.S. defense system. But in the wake of a recent North Korean "satellite launch" – a launch that global security experts said was a thinly veiled ICBM test, South Korea and the United States plan to formally discuss deploying THAAD. "North Korea continues to develop their nuclear weapons and ballistic missile programs, and it is the responsibility of our Alliance to maintain a strong defense against those threats," said Gen. Curtis Scaparrotti, commander of U.S. Forces Korea. "THAAD can add an important capability in a layered and effective missile defense." Here's the bottom line on all that missile maneuvering: By putting SAMs on Woody Island, China is able to "destroy aircraft, and knock cruise and ballistic missiles out of the sky" as far away as 125 miles, Foreign Policy said in a recent e-letter issue. A sticking point: Beijing wants that capability in the region, but of course it doesn't want anyone else to have the same. You can't blame China, of course. But that attempt to "alter the status quo," as strategists have been saying, is why the United States, Japan, Taiwan, and others are so angry – and afraid. As they should be. For Beijing, which has long advanced its causes quietly, surreptitiously, and with calculating stealth, has become openly aggressive. Late last year, as part of what Bloomberg Business described as the "biggest Army overhaul in decades to [better] project power," China's People's Liberation Army (PLA) constituted a new, dedicated PLA Rocket Force from its old Second Artillery Corps. From an organizational and management standpoint, it's a smart move. The U.S. military made a very similar move at the end of the Cold War, when it merged the U.S. Space Command with the vaunted Strategic Air Command (made famous by U.S. Air Force Gen. Curtis "Old Iron Pants" LeMay) to create the U.S. Strategic Command (USSTRATCOM), which now has responsibility for ballistic missiles. In the inauguration ceremony, China President Xi said the PLA Rocket Force is a "core force of strategic deterrence, a strategic buttress to the country's position as a major power, and an important building block in upholding national security." This new PLA unit will maintain both conventional and nuclear weapons and will be responsible for first strikes, counterstrikes and deterrence – in a "strategic check-and-balance capacity," said the Xinhua News Service. According to some reports, the PLA Rocket Command could have ultimate control of China's entire "strategic triad" of ground-, air-, and submarine-launched nukes. "March of the Strategic Rocket Force"
Onward march, onward march/Heroic Rocket Force! But in a move that seems to capture the overt aggressiveness I mentioned, China's military just released a new song and video to commemorate the creation of the PLA Rocket Force. You can watch it in the window – it's a not-quite-Busby-Berkley, song and dance demonstration of China's military missile prowess that should be seen to be believed. The breathless lyrics don't leave much to the imagination, either. That part about the "Eastern Wind" is a naked reference to China's Dongfeng (East Wind) series of nuclear-capable ballistic missiles. We're not overhyping Beijing's global aggressiveness – a brand of worldwide one-upmanship whose ultimate goal is to position China as World Power No. 1. The country just secured "basing rights" right next door to America's top drone base in Africa. For the U.S. military, the East Africa nation of Djibouti is a key to its expanding counterterrorism push in that part of the world – since it's the base for both the U.S. armed drone missions and "special operations" efforts directed at ISIS. But as FP writes, Djibouti President Ismail Omar Guelleh – "taking advantage of the open-wallet policy that Beijing is using to expand its military footprint around the globe" – has OK'd a $590 million new port facility that will serve as a berth for the Chinese navy. It is part of $12.4 billion in upgrades to Djibouti shipping facilities that are being funded, in part, by Chinese companies. This interesting move comes after the Pentagon shut down its drone base in neighboring Ethiopia – and as Washington gets ready to drop about $200 million in North Africa for a passel of counterterrorism projects, many of which will drive work to the Djibouti facility. Djibouti is a country of fewer than 1 million people. And its economy depends greatly on money dropped by foreign governments that see the country's location as a strategic spot to base troops and drones and dock and restock ships. The United States and France both have big representations there – and it's the location of Japan's only overseas military base. Now China is moving in, right down the street. As Guelleh told Reuters last month, China has the "right to defend [its] interests, just like everybody else does." But standard procedure usually persuades competing militaries to operate in divergent locales – and to gather the goods on their rivals via old-fashioned spying. Becoming "neighbors" smacks of one-upmanship. This aggressiveness is risky in a military situation – especially one as touchy as the South China Sea standoff. Watch this carefully, for a trigger to action will have a major – decidedly negative – impact on stocks. But in an economic situation, this same desire to win makes for an alluring long-term profit opportunity. And that's why I continue to urge folks to "accumulate" such China-focused investments as Alibaba Group Holding Ltd. (NYSE: BABA). There's a lot of time for investments like that to run their predicted course – and to overcome the pain that a conflagration in Asia could cause. That, however, is another topic… for another time. Trump's "Super Tuesday Surprise"... Donald Trump will likely all but lock down the Republican nomination. Our independent research leads us to believe that he could move immediately to have "The Wall" built. That's because we've uncovered proof that Trump has as much as a $1.55 million stake in a company that's about to roll out technology tailor-made for massive infrastructure projects. Click here for full analysis. Thank you for in-depth news items and maps. Money Morning correctly notes that news media seem not to care about vital issues that beset earth – vital to we as individuals and as members of thriving Planet Earth. So few folks seem aware how vast is America's potential, in fact, how great is any nation's potential. First, my sincerest apologies for taking this long to respond. And, second, please allow me to formally and sincerely say "thank you" for a post that was as eloquent as it was kind. Notes like this – in which my readers tell me that my work has made a difference in their thinking, and in their lives – makes very worthwhile the long hours I spend looking for ideas, watching developments and crafting my columns. One thing that's especially heartening is the knowledge that – both here at Money Morning and in my subscription-based Private Briefing advisory service – we serve a group of investors who are smarter than the masses, who think for themselves, and who (like you) are articulate, interesting and fun to deal with. Readers like you often say that you're lucky to have us. That's rewarding to hear. But I actually believe that we're lucky to have you. I just returned from Panama. No mosquitos there, not one and I was all over the country. Go, have fun, enjoy! "We were one of the first U.S. media outlets to warn that Beijing's desire to cordon off the South China Sea would set it on a collision course with Washington." China have no intention of 'cordoning off' the South China Sea, they have stated many times, International Shipping lanes wont be affected, but US, who have no claim, insist on rattling their sabre. The US navy insist on sailing within 12 miles of the Islands, when 13 is appropriate. The only people intent on a collision course are America, in pursuit of her hegemony!